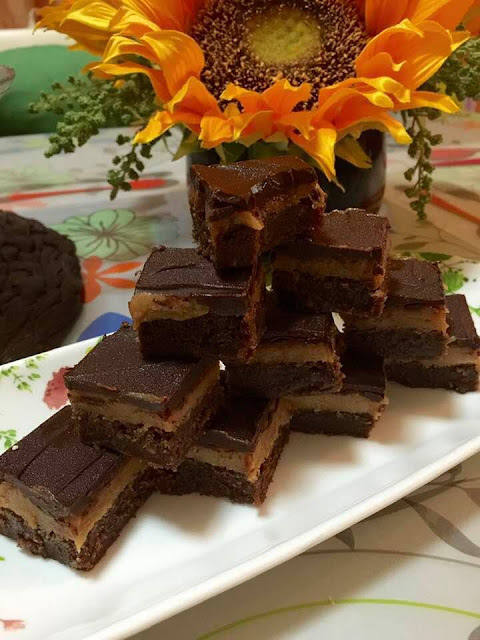 How would you like a brownie with caramel and chocolate? The combination is interestingly good; brownie,caramel and chocolate. Certainly you will not pass on this. When I first bake these bars, I never thought its gonna be that good but gosh, they're heavenly ! As early as November my mind would go to the bars and squares that I love to bake for our festive consumption at home or for giveaway to the people that I deemed worthy of my time and effort. Lol! 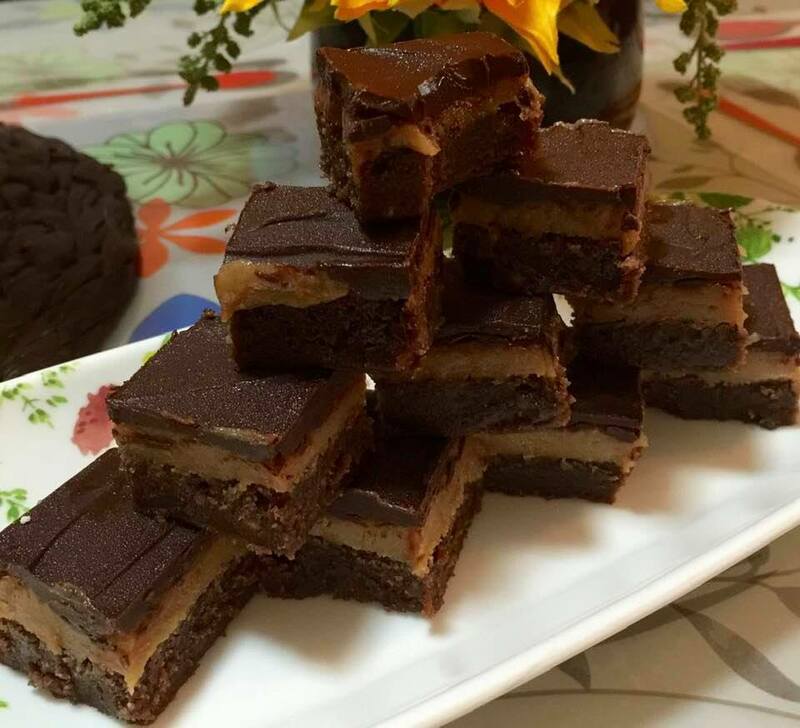 These brownie squares are so good that past holiday season already and yet the memories on your palate lingers on. It will also be nice if you add some kick on it like rum or brandy. 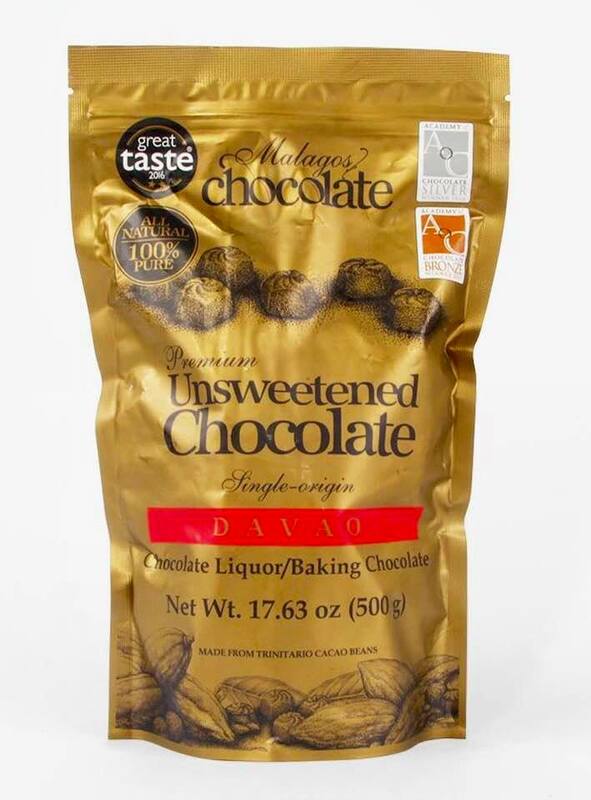 Last two years ago I discovered this locally made Cacao Chocolates from the Philippines and I began to use it in most of my chocolate baking sprees and I love it. I made Brownies then and my son gave some to his local friends here in Singapore. The verdict- it was so good that they remember the aftermath of its taste...strong but delicious, addictive and not so sweet. In a saucepan,combine all ingredients except cornstarch with water. Cook until thick and caramel in color for about 30 minutes, then stir in cornstarch with water,mix until caramel is thick. Combine all in a dish. Microwave until just half melted.Stir until melted and combined.Set aside. Prepare a square baking pan 8x12x2inch,line it with aluminum foil. Spray with oil or smear with butter. In a saucepan, put butter, cocoa powder and tablea .Stir over low heat until melted and smooth. Remove from heat. Add sugar and stir until incorporated. Add vanilla and eggs,one at a time. at 180 ( 350 ) for 30 minutes. Let it cool. Once caramel is done,immediately pour over the baked brownie.Chill for about an hour in the fridge.Then proceed on making the topping. Spread over the caramel layer and chill until set.You will have about 24 squares. Note:Caramel is best done after baking the brownie.If you want a better squared cut,use a sharp knife dip in hot water, dry then cut. I tried to cut nice and clean but sorry I am not good in that area. I tried my best not to eat while on the process of slicing but the chocolate seems to melt on my fingers. I realized I must go ahead and try, why not..grab and eat them. Thank you Cindy for coming over and for the lovely comment. Have a great week ahead. Wow! Your brownies look so good. :) Thanks for sharing at Cooking and Crafting with J & J! Thank you Julie, you are most welcome. Have a great week ahead. Thank you and have a great week ahead to you. Thank you for coming over Jane. Please try. Have a great week ahead. These sound delicious. Thanks for sharing at the To Grandma's House We Go DIY, Crafts, Recipes and More Link Party. I pinned this! Hope to have you join again this week. Hello Sheri, thank you for coming over. Yes, I will be there again and again. Have a great week ahead. Your Brownies look fantastic! Hope you are having a good week and thanks so much for sharing with us at Full Plate Thursday! Thank you Miz Helen, you are most welcome. Have a great week ahead. These look amazing! Thanks for sharing this at Home Sweet Home and have a Merry Christmas! Thank you so much for coming over. you are most welcome. Merry christmas to you and to your family.